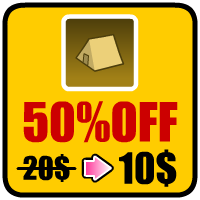 I created and shared the original game for free, but unfortunately the production money is runnnig dry, so I created a paid version. Please enter the trial pass [ hirake-goma ] in the screen below, and you can play this game partially. 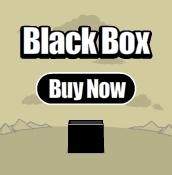 Let's go to this site, if you would like purchase the rest of the game. 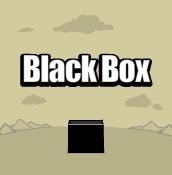 [Black Box] won first prize among the "Best of 2012 award" in the Point-and-Click Puzzle category of Jayisgames.com. 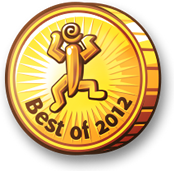 Also, it was ranked 4th among the 2012 free puzzle game in IndieGames.com. Too fancy! Over cute! What do you know? 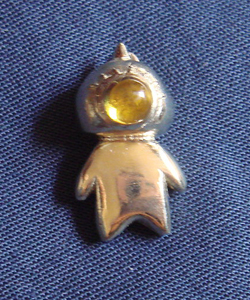 popular character in my site. She sent me the real things, the real one is more cute. Now, they become cell-phone straps and made it to my home. Here is full lineup. But please be sure that they are not for sale. Well, thank you ,thank you very much KIAsan !! I'm very happy! too happy! too fancy! How cute! on the same display as left . Excuse me for the belated New Year greetings. I'd like to take this occasion to wish you a Happy New Year. I'm going to create something pretty funny. Well, the small one is now in production. I must apologize for my long silence. I'm sorry to be late for releasing a new game. I had many other things to do during New year holidays. I get my new game plan started. Thank you very much for waiting me so long. 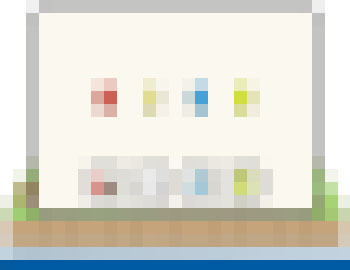 The first new game is going to be released within a few days. Please look forward the new game! 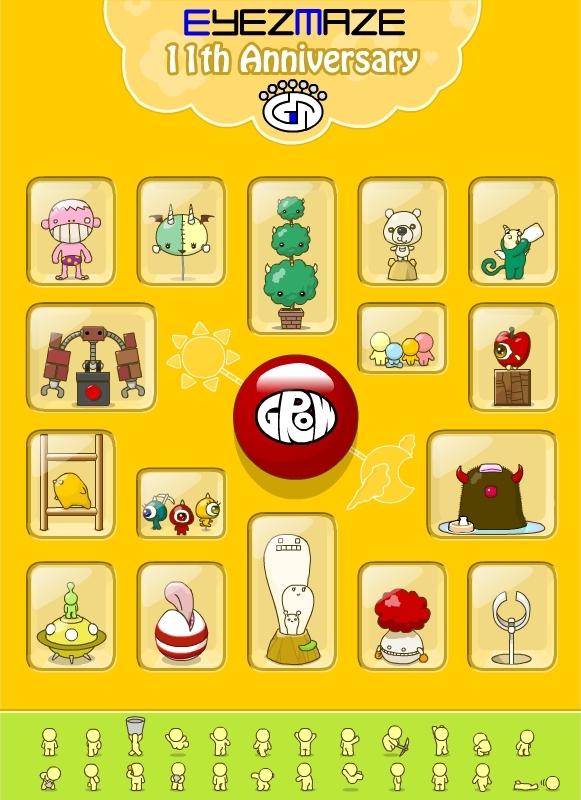 It is difficult to play GROW ver.3 on the latest version of Flash Player. The version checking function is inoperative, cause of changing script specification. I know it needs amendment. I would really like to do it. but I can't fix it now. I couldn't call up the ver.3 files when my PC was crashed. Lucky for me, I hold pictures. If I had enough time to re-write all scripts, it would be released again. Well, it seems to be impossible now. Please forget the ver.3 for a while. which GROW game do you like the best? It has been almost 2 weeks since I released the GROW Tower and it seemed a bit calmer. There are only 5 panels and I was afraid if this game would please everybody. But I'm happy now that many people seem to enjoy it. And I'm very glad many people told me [worth the wait] even it took a long time before it released. Just random thought but I want to ask players' feeling. I think there are different feelings between a creator and a player. So, which GROW game do you like the best? I'm happy if you give an answer to the comment field. may be... I think [CUBE] is the most poplar among players. I really want to know the next mark and followings. For me as a creator, I like [RPG] the best. This game is a second one, but it is not the same organization as the first GROW. I was intoxicated with my idea at that time. If you don't play all the games, it's OK! Please tell me the best one among the games which you had played. Thank you very much for your answers of the best GROW. I'm appreciated that more people gave comments than I expected. The result of questionnaire on male-female ratio of EYEZMAZE. I made some pages in some languages for spreading accesses. Because the new game attracted so many visitors that the server crashed. Please try using these pages. As I used free translation software,there must be a lot of strange expressions. I'm very appreciated that you native speakers tell me the right expressions. I've learned free translation software's quality. But I'm very appreciated that many people from many countries offer to proofread them. These strange sentences would be steadily improved. Thank you ! thank you very very very very veeeeeeeeeery much for your help. 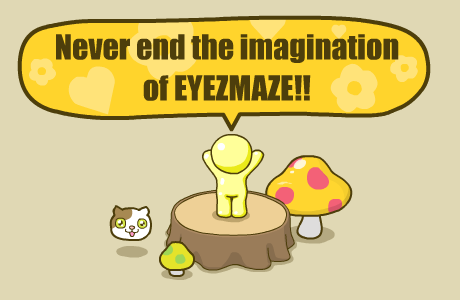 I realize how much everyone support EYEZMAZE. I would keep creating the new interesting contents in the future. All 6 languages go round and round in my brain in these days. This makes my brain go squish. 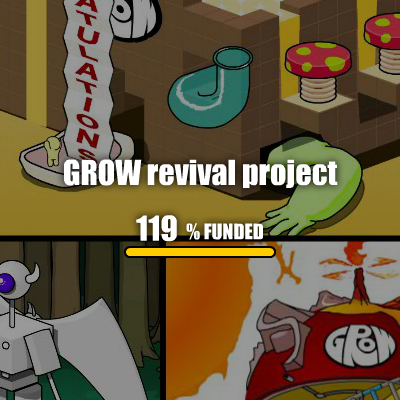 [Grow ver.3] is under repair. As I mentioned before,[Grow ver.3] doesn't work in the latest Flash player. Since I lost the original flash files, I have not corrected for a while. But many kind supporters told me good programs to correct the problems,and I go back to this work. Well,this is good chance to put some gimmicks which I gave up to build them into it last time. I think it becomes improving slightly. 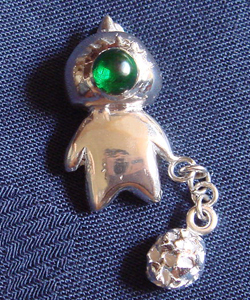 it may differ slightly from the completed version's one. My head was blown off !! I bought a new PC and start the default setting. But it doesn't work out. My new PC still has much work to do for the starting. I want to shut my eyes. I made a wallpaper of escape. I've finished the default setting for a new PC !!. My sincerest apologies for the delay in updating my website. Well, starting to calm down a bit now. 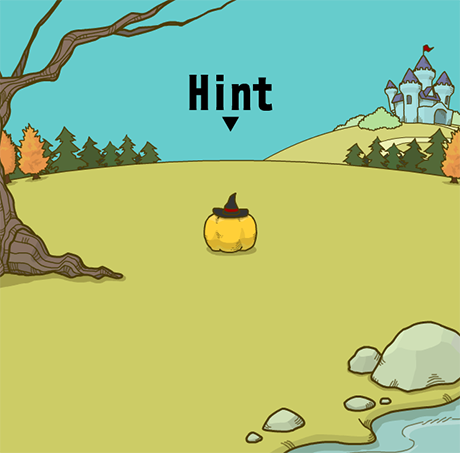 I'm going to introduce some games though only gradually. I'm sorry that it's a very slow- paced to make them. The sequel to "GROW Island" is now in production. The sequel to "GROW Island", titled [GROW Valley(tentative)] is now in production. It will be released in the end of August. I'm very sorry that you have to wait for the new game so long. I think it will be so good. Just give me a little more time. One of the hugest earthquake hit Tohoku and Kanto area in Japan. and following Tsunami and nuclear accident. Everything is quite confused here and in Tohoku and Kanto section. Now I have to stop making anything for a while. Thank you very much for your encouragement!! 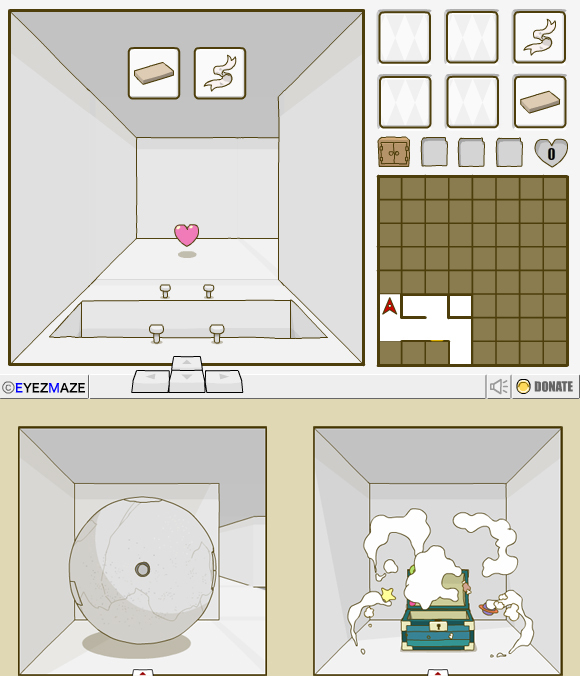 It has been 11years since EYEZMAZE had started. Unfortunately I didn't notice that last year was the 10th anniversary. Many people seemed to have said that it was a shame to close the[DWARF COMPLETE] . Why don't you play it after so long. The new GROW is due to be released. 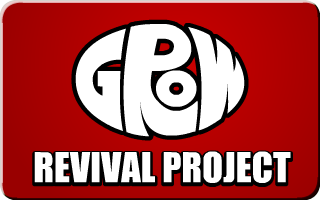 I'm going to release the new GROW in the near future. I succeeded for a new attempt. I developed this new game by trial and error, in the face of great difficulties. I had no idea what was happen. Well, it's nearly finished with my work for it, although it includes as 80% as originally scheduled, because of technically difficulties. It has been a while,I'm proudly offering you this new GROW.